According to a recent report from WHO, India cities are on the top in terms of bad air quality. Almost all major cities like Delhi, Mumbai, Jaipur are facing this problem. If you are living in one of the cities where the air quality is bad, buying an air purifier is a good idea. We spend most of our time and exposure to poor indoor air can lead to various health issues. PM 2.5 particles are really small and are not visible to naked eye. They very dangerous for our health and air purifiers can help to reduce the PM 2.5 concentrations. Air purifiers have become very affordable in the last few years and you can get really good purifiers from under Rs. 10000. In this article, we have covered best air purifiers under 10000, 15000 and 20000 in India 2019. Purifiers from top brands like Mi, Philips, Honeywell, Samsung, and Kent are listed here. All these purifiers are latest and were launched in 2019 or before. We have provided 3 options under Rs. 10000, 2 options under 15000 and 2 options under 20000. There are a ton of air purifiers available in the market so we have included the options which perform great and provide good value for money as well. Filters are an important part of the air purifier and you would need to replace the filters after a few months of use so we have considered the availability of filters as well. It doesn't make sense to buy an air purifier if its filters are not easily available. Let's first take a look at the best air purifiers under 10000 and then we will move to the ones priced under 15k and 20k. The first 4 purifiers are priced under Rs. 10000, next 2 are priced under 15000 and the last one is priced under or around Rs. 20000. Mi/Redmi/Xiaomi is a the top brand in India in the smartphones category. Mi also makes a lot of other products as well and this air purifier is one of them. It is one the best selling air purifier in India and is highly rated by thousands of users on Flipkart and Amazon. This Mi Air purifier is a portable air purifier. It doesn't have wheels at the bottom but still, you can pick it up and place it another room as it weighs just around 5 Kg. The filter inside the air purifier is of HEPA type. HEPA(High-Efficiency Particulate Arrestor) filters are great for filtering our fine particles/pollutants from the air by forcing the air through a mesh. Most of the air purifiers on this list have a HEPA filter. 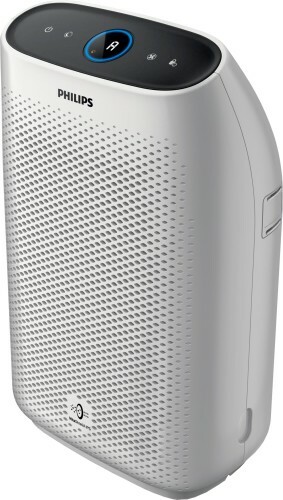 The Mi Air purifier has a coverage area of 400 sq. ft. and consumes 31 watts of power. The 400 sq. ft. coverage area is really good and it will work well even in big rooms. 31 Watts of power is similar to what a tube light will consume so it is power efficient as well. It has an inbuilt air quality monitoring system and you can view the air quality using a mobile app which gets linked to the air purifier. You can control the purifier with this mobile app. The app also recommends if you should open the windows or close them depending on the air quality outside. You can also call it a Smart Air Purifier because of its capability to connect with your smartphone via an app. This is the latest version of Mi Air Purifier 2 and here the main difference is that this one comes with an OLED display on the front where you can see air quality levels. Earlier it was possible only through the mobile app. The Mi Air purifier has a 360-degree cylindrical filter which helps to circulate air faster. The motor of the air purifier doesn't make much noise so you won't be disturbed during sleep. Mi Air purifier airflow level is 310 cu.m/hr which is really good. At this rate, it would clean the air inside the master bedroom in just 8 minutes. The purifier doesn't have a humidifier but it does come with Activated Carbon Filter to remove odor and harmful substances. Overall, this is a great air purifier under Rs. 10000 and one of our favorites as well. It is available on Amazon and Flipkart. Links are given below. Coverage Area: 677 sq. ft.
Philips is a brand that doesn't need any introduction. 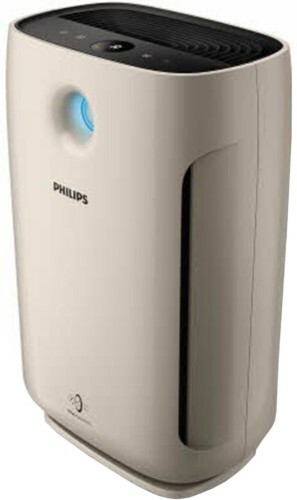 Philips has a wide range of air purifiers and this is the best option from them under 10000 Rs. in India. It is a portable air purifier just like the one from Mi. It weighs around 7 Kg and doesn't have any wheels at the bottom so you need to pick it up to place it somewhere else. The filter type is HEPA which is good for filtering out fine particles in the air. It has an excellent coverage area of 677 sq. ft. You can place if in the lobby as well. The air flow is 270 cu.m/hr which is decent. It consumes 50 watts of power. The controls of the air purifier are on the top side of the purifier. It also has a display which shows air quality of the room on a scale of 1 to 12. The purifier has an auto mode which means if it sees that PM 2.5 levels are rising because of pollution coming from outside or cleaning inside the house then it will auto adjust its speed to clean the air faster and improve the air quality. The purifier will alert you when a new filter is required. It also has a child lock so that kids at your home won't be able to change settings by randomly touching the control panel. Overall, it is an air purifier with good performance and value for money. It is also available on Flipkart and Amazon. Check them out below. Coverage Area: 270 sq. ft. 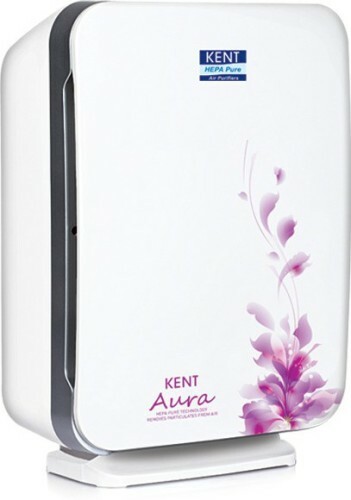 This air purifier comes from the brand Kent which is known for making great water purifiers. It is a portable air purifier and weighs around 5 Kg. The filter is HEPA which will take care of the PM 2.5 particles. It also has a carbon filter to get rid of the foul odor. The air quality is indicated by a glowing LED. It continuously monitors the air quality and adjusts the speed according to it. It doesn't have any mobile app so you need to manually operate it via the controls provided on the purifier's body. Other features on the Kent air purifier are auto filter change reminder and child lock. The purifier monitors the filter condition and alerts you when a new filter is required. Child lock is useful if you have kids at home. This purifier has low air flow and coverage as compared to the Philips and Mi air purifier. Still, the purifier is a very good option considering the fact that most people will use the air purifier in their bedrooms which will have an area of around 150 sq ft. in most cases. It is also available on both Amazon and Flipkart. Buy them via links below. This air purifier is loaded with features and comes from the company Atlanta Healthcare. The USP of the air purifier is that it has a UV filter as well. UV filter is not usually available in the under 10000 range. The air purifier has a nice display on the front with controls with which you can switch it on/off, control modes, control speed and see air quality levels. It also comes with a remote control which makes it easier to operate. This air purifier has a 7 stages of air purification. Stages include Pre-filter, Anti-bacterial filter, H13 grade HEPA filter, Activated Carbon filter, Photo Catalyst filter, Ultra Violet lamp, and an Ionizer. The main difference here is the UV filter. The Ultraviolet filter effectively kills micro-organisms and sterilizes the air from bacteria and virus which means this air purifier is not only removing pollutants but bacteria as well. This air purifier will make sure your loved ones are safe from ailments like allergies, asthma, and air-borne infections. Coverage Area: 420 sq. ft. This air purifier comes from Samsung which is one of the top consumer electronics company in India. Samsung has a wide range of products and they have introduced air purifiers recently. Samsung has a wide service network across India and you won't face any issues while availing service if anything breaks down. 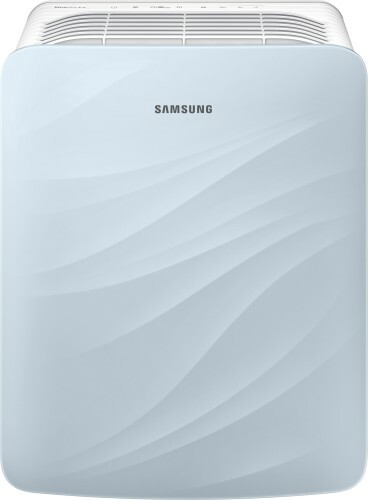 The Samsung air purifier has HEPA type filter and is good for filtering out PM 2.5 particles. It also helps to remove foul odor using the charcoal filter. It will also reduce bacteria and viruses with the help of S-Plasma ionizer. It also captures airborne allergens, like pollen, so the air you inhale is clean and healthy. The air purifier has a coverage area of 420 sq. ft, so you can keep it in your master bedroom or living room as well. It has an air flow of 319 cu,m per hour which is really good. The purifier weighs 6.5 Kg and doesn't have wheels so you need to pick it to move it to other rooms. The power consumption of the purifier is 34 watts which makes it one of the most power efficient purifiers. The controls of the purifier are placed on the top. You can control the modes and speed of the purifier. The purifier alerts you about filter change or filter wash through led indicators. You can wash the filters of this purifier which is a positive point. Good performance, decent price, and excellent after-sales service make it one of the best air purifiers under 15000 in India. Coverage Area: 851 sq. ft. This air purifier from Philips is more powerful than the one we saw above and is priced around Rs. 15000 in India. The build quality of the purifier is great. All the controls are on the top side of the purifier. The 4 color air quality indicator is also placed on the top of the purifier. The purifier is a bit big and weighs around 10 Kg. The power consumption is 60 watts. The coverage area of the purifier is 851 sq. ft which means you can cover your lobby/living room as well. It has an air flow of 344 cubic meter per hour. The numrical display on the top shows air quality level of 1 to 12. It also changes color from red to blue as air quality improves. It continuously monitors the air and automatically adjusts the fan speed when it detects changes in particle levels. It has 2 modes: pollution mode and Bacteria Virus mode. It also has carbon filter to remove odor from the room. Other usual features like filter change indicator are also there. If you have a budget of around Rs. 15000 and need a air purifier for a large room, then this one is a great option. Coverage Area: 1027 sq. ft. 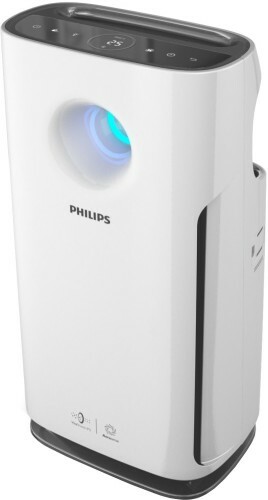 This Philips air purifier is for those who have a very large room/hall and are looking to spend around Rs. 20000 on an air purifie. This purifier comes with a lot of features. It has an excellent area coverage of around 1000 sq. ft. The air flow is decent at 367 cubic meter per hours and it consumes 60 watts of power. A touch control panel is provided on the top to change settings of the air purifier. The top also houses a nice digital display which shows the current mode and air quality as well. The air purifier comes with VitaSheild IPS technology. With this technology the air purifier can remove microscopic allergens, as small as 0.02 micro metre. It also helps to keep harmful viruses such as H1N1 at bay with the thick NanoProtect S3 filter boost. When you are going to sleep, you can use the sleep mode which lowers the fan speed and reduces the noise level to 33 dB. Plus, you also have the option to turn off the indicator lights to sleep without any disturbance. This is our choice for the best air purifier under 20000 Rs. in India. It is a great performer and perfect fit for large rooms or small offices as well. It is available on both Flipkart and Amazon. So this was our list of best air purifiers under 10000, 15000 and 20000 in India 2019. We hope that you found the list helpful and you were able to find a suitable air purifier for your home. If you are confused the take a look at the features again. If your budget is 10k then we have a lot of good options. Mi Air purifier is great as you can see a lot of information on their app and control the purifier with it. 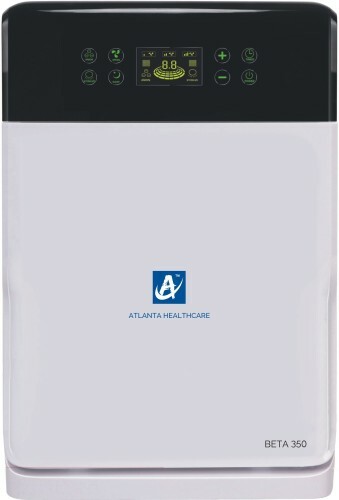 Atlanta Healthcare air purifier is the only one which comes with a UV filter. Other options from Philips are also great performers. If your budget is around 20000 then Philips Aerasense is the best air purifier you can get. It is loaded with features and the performance is excellent as well.